Holy unbelievable acts of common sense we never thought we'd see in our own lifetime, Batman! "I never imagined being presented with a bill that could require candidates for President of the greatest and most powerful nation on earth to submit their 'early baptismal or circumcision certificates'...this is a bridge too far...this measure creates significant new problems while failing to do anything constructive for Arizona." The fact that the President of the United States even has to address such a stupid conspiracy theory is sad, but it only underscores the important sea-change of Governor Brewer's veto against her own party in Arizona. At some point, America, enough is enough. At some point we go beyond the acceptable bounds of mere political spin and cross over into the land of the "nutty right" as Karl Rove described it when talking about Donald Trump's fall from grace as a "real" Republican candidate. 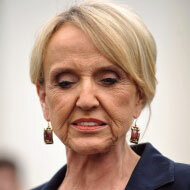 Apparently Governor Brewer recognized that and chose to exercise her veto against the "nutty right." After all, doesn't Arizona have enough problems to worry about already? After last week's shellacking from the 9th Circuit Court of Appeals on Arizona's immigration law, do they really need to have another battle with the federal government about the Constitutionality of a State attempting to actually block a Federal Presidential candidate??? A Presidential candidate, mind you, who would be on the ballots of all the other 49 states in this country EXCEPT for Arizona. Try making that legal argument with a straight face in front of a judge. Did last week's shellacking from the Court of Appeals change Brewer's mind on this issue? Is the reputation of Arizona as a right-wing fringe state possibly responsible for yesterday's veto? Is Obama correct in saying that "most people feel confident" that he was born in Hawaii? Is Karl Rove correct that President Obama is purposely allowing the Birther issue to continue because "he knows it discredits [Republicans] with the vast majority of the American people"? EXTRA CREDIT: Please make the argument on how this law would have helped the people of Arizona in any way, shape or form.